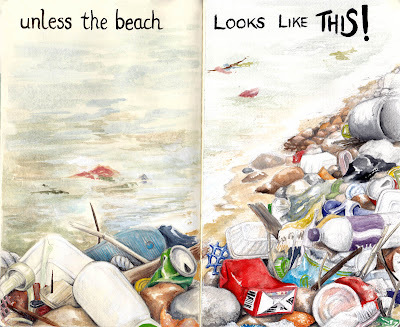 This makes me very sad too as it is so harmful to marine and shore life. Your sketch is beautifully done. You are an awesome illustrator! I think you should just write your own book and publish it! I'm so inspired by your creative compositions! I love these 2 spreads Debra. What a contrast between the two. You have captured the murky water perfectly. Both pages are really good, I'm glad you show the good and bad about where you live...it's very sad how we are polluting the world, the smae happens here too. Your sketchbook is wonderful! I've enjoyed visiting your blog and looking at your incredible artwork! Great sketch. This stuff drives me nuts too. I spend half my retirement days picking up trash at beaches, parking lots and parks most of which have trash cans nearby. I like your art. It makes me angry actually... that people are just so inconsiderate and selfish. I hope that the beach will be cleaned up soon, and perhaps the authority should impost some heavy fines to those who litter. Things like that will only concern people like that if it affects their wallet. All aside, it's a beautiful drawing with a powerful message. Thanks for visiting my site Debra. And regarding that 'updates' that appeared overnight, it's entirely my fault playing around with the site feed and not knowing what I was doing. My wife pointed it out yesterday and I realized that it never did show any updates ^^ Sorry about that. I've been going through all your sketchbook pages, they are all so fantastic. I will try and see it in person in NY.